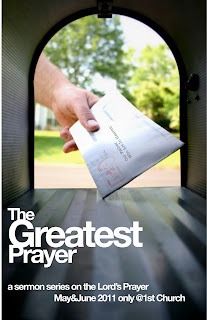 The Greatest Prayer - Week 4 - "Thy Will Be Done"
This week I'll be preaching the fourth installment of the sermon series, "The Greatest Prayer" a study on the Lord's Prayer. We've been going line by line through the prayer so that we can gain a better understanding of what we are praying when we pray the Lord's Prayer. I told my congregation this past week that my hope was that we would become a church full of people who are not just "saying" the Lord's Prayer, but a church of full or people who are "praying" the Lord's Prayer. The fourth line of the prayer is "Thy will be done on earth as it is in heaven." There's a burning question imbedded in this line of the prayer that anyone who believes in God has asked at one time or another in their life: "How do we know God's will?" Like we have done with each of the preceding lines of the Lord's Prayer, we need an explanation of what we are really praying when we pray, "Thy will be done..." to God. You see, I believe that when we pray this line of the Greatest Prayer, we are actually saying, "When I submit my will to God's will, God's will gets done." So is everything that happens part of God's will? I had occasion to ponder that this week as I read about a new phenomenon that seems to be sweeping the nation and online communities: Planking. Sadly, Planking has claimed the life of one would-be planker, who plunged to his death when he tried to plank on a balcony. Here's the story. So my question is this: Is this God's will? Is this how God intended for people to use the great gift of life that they have been given... by planking? Is God linking this on his Facebook page? I'm fairly certain that he isn't, and that this kind of thing is not part of what we would understand as "God's will." You might be saying at this point, "But Leon, what about that verse in the Bible that says that all things work together for good...and all that stuff?" Yes, Romans 8:28 does get used by lots of well-meaning Christians who want to say something profound to a suffering friend, colleague or family member. But no where in the text does it say that God causes all things to happen--both good and bad. What is implied in this verse is that God has the power to redeem even the most awful event. While this might give some of us comfort, we still struggle to understand the ways of God and the will of God. Here's the thing, if you aren't asking yourself questions about the will of God in the world, in your life, and for the future... You're either complacent or a complete saint. Seriously. You either don't care at all about it, and are content to just muddle along in life without really considering what God's will for your life or the world is all about, or you are completely serene and saintlike. Most of us are in between the two somewhere. When Jesus prayed, "They will be done on Earth as it is in Heaven," what was he saying exactly? First, he was acknowledging something that should be obvious to most of us: Heaven already gets it. In Heaven, God's will is being done, it's realized, it's owned, it's embraced, it's all the rage. And Heaven isn't some far away place "up there," it's closer to us than we think---breaking through into our world every so often. When Jesus said, "on Earth as it is in Heaven," he was also acknowledging that God's will isn't always being done on Earth. "May there be created here on earth those conditions in which the will of God is done clearly and unmistakably as it is in heaven." Why is this important for us to know? You see, far too many Christians have come to confuse God's will with a set of rules and regulations that they received from their church, pastor, denomination, religious upbringing, etc., etc. God's will is not a list of things that you must check off. God's will isn't some sort of test that you must pass. God's will is synonymous with God's presence. Where God's will is being done... you can bet that God is present. So how do we know when God's will is being done here on Earth? I've come to understand this in my own life, but I am sure it is true for everyone who calls themselves a Christian: When it comes to God's will, we all have 20/20 hindsight. Even though I struggle sometimes to understand what God's will is all about now, I have had more than a few moments to look back and see where God was present all along. This is helpful. Once you begin to see the places and spaces where God's presence/will happened, you start to recognize it in the present. Also, God's will is breaking through (Heaven came down, and glory filled my...) into this world whenever our will submits to God's will. This is an echo of my main point, or take away if you will. It makes sense, though. God's will is being done on Earth as it is in Heaven whenever we submit our will to God's and allow the presence of God to guide our path, govern our actions and reign over lives. Finally, we need to understand that not everything that happens is the "will of God" in the sense of it being His intention. Planking is not part of God's intentional will. A young man's life being ended by planking most definitely is not part of God's intentional will. Let's take this further. God's will is not being done when a child is murdered. I saw a horrible story recently about the body of an unidentified little boy was found wrapped in a blanket on the side of the road. When I read that story, I got choked up as I thought of the terror of that little boy's last moments. I have three boys, and my heart broke to think about it. I asked God in that moment "this couldn't possibly be your will could it?" I feel like God's reply to that question is, "No, but I was the first one there to weep." God's will is not being done when a child is murdered, but it is being done when a child is brought to the church for baptism by her parents. God's will is not being done when a soldier is killed on the field of battle. God's will is done, however, when peace breaks out and reigns. Sometimes we don't know what we really need. We pray for peace, we pray for patience, we pray for God's will to be done in our life, and what we might need instead is absolute transformation, re-dedication, renewal or even redemption. The Holy Spirit of God that moves among us now-- revealing Jesus Christ to us, teaching us and guiding us to truth--knows what we need and offers these prayers to God as "groans" that we cannot give voice. But we should also pray it with confidence, knowing that God's will is God's presence, and the presence of God surrounds us, goes before us, is in us and through us. Then perhaps our eyes will be opened and we'll see where God is already at work in the world, and we will submit our will to His and join Him there.